11 ways to make a boxed cake better. I enjoy making my cakes from scratch, but sometimes you need a quick and easy cake. Boxed cakes are not only easy but a staple in many kitchens. I know many people that use boxed cake and make beautiful staked cakes, birthday cakes and even wedding cakes with them. Here are some tips that I've collected from others that work to make their boxed cakes beautiful and unique. 1. Pudding in the mix? Don't add any pudding to a cake that has pudding in it. It'll get mushy. BUT you can add a box of instant pudding to a non-pudding cake mix and that will make it stiffer and stay moist. The flavour is great too. After some conversations and investigating I've found a recipe that a lot of people use to get a nice moist dense cake. 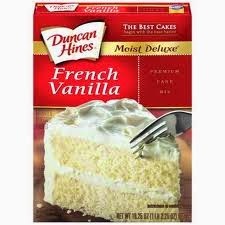 With a Duncan Hines Cake mix (this seems to be the consensus) and use 2- 8" cake pans. Add 1 Cup of Sour Cream, add 1 Cup of flour (mixing well so there are no lumps), 1 Cup Sugar and 1/2 Cup butter melted. Bake at 325 for about 35-40 minutes. The other recipes I've found used mayo instead of the sour cream. -Use fruit juice to change the flavour. -Kahlua works nice in a chocolate cake. One of my favourites! -Buttermilk also gives a nice rich flavour. Want a lower fat cake-- add applesauce instead of the oil. This gives it a nice flavour without the added fat. A non fat yogurt or sour cream also works. It uses Diet Soda as the liquid.. There would be a lot of variations with the different Diet Pop's out there..
-add some cinnamon; this is nice with coffee as the liquid. -add nutmeg, allspice, ginger or cloves. All to taste but start with 1/2 teaspoon to 2 teaspoons. Add some lemon,lime or orange zest. This will bring out some of the flavours and add some bright citrus flavour. Easily done by a zester (but a a cheese grater on the small end does work). Add the lovely scraped rind to the batter. -Want to have an orange cake? add orange juice instead of the water--and orange zest. -Make a blueberry, raspberry or a berry flavoured cake by adding the fruit puree to the mix. A cup of puree works well. You can also make banana, peach, apricot and more. -Add more flavour by adding more vanilla extract or almond. Add some nuts to your cake mix. Add some walnuts, almonds or pecans to your cake mix. OR get a little creative and add a cup of peanut butter to the mix. Add some whole fruit. Chunks of pineapple, frozen blueberries (if you use frozen the cake mix won't turn blue as you mix), strawberries, raspberries or another fruit. -cut up a couple apples and lay them on a bottom of a pan, add some cinnamon (about 1 tsp), and about a 1/2 cup of brown sugar. Make the cake mix in another bowl and substitute the water for coffee. Once mixed dump over the apples-- don't mix--keep the apples on the bottom. Bake for 35-40 minutes at 325. Once out, let cool and flip over-- Voila you have a nice apple upside down cake. Doesn't even have to be iced.. This recipe also works for pineapple rings. 11. Don't make a cake--Make cupcakes! Change it up and take your boxed cake mix and make some cupcakes. There are many recipes out there that can help you make your cake into mini cakes! Here is one that kids love: Worm Cupcakes. Overall cake mixes are easy to use and you can be very creative with them. So have fun-- invent a new cheesecake bar with a boxed mix or come up with a crazy cookie recipe using boxed cake mix. Got a favourite recipe? please let us know and share.